Lynnsport & Leisure Park, situated in seventy-two acres of parkland near King's Lynn in Norfolk, is one of the largest sports and leisure facilities in the country. At the heart of the centre is the Bodyworks Fitness Suite offering a full range of cardio-vascular machines, resistance equipment and free weights. 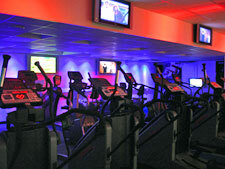 The Sound Division Group recently won the contract to supply and install a sophisticated Tryka LED colour change lighting system with Pulsar control, a 24-station 8-channel Audeon wireless cardio entertainment system and numerous plasma and LED screens, plus an Abstract VRX Gladiator lighting system in the spinning studio. The brief was to provide a thoroughly modern yet sympathetic environment for exercisers using the latest technology. However, it had to be a system that would be easy for untrained personnel to use and operate. To that end, Sound Division installed twenty-four Audeon 28 RX6 wireless personal receivers on the CV machines and the same number of Audeon 28 CS wireless Csafe docking chargers. The AV distribution system comprising two Strong SRT5116 digital top boxes and an 8-way RF distribution amplifier offering connection to satellite and terrestrial TV and FM radio provides the source material for the Audeon entertainment system. A Tryka LED architectural lighting system based on Tryka's Module 3 RGB compact, high-powered colour change LED module provides spectacular colour wash effects for the walls and ceiling. Sound Division installed a total of thirty-eight units controlled by a Pulsar Masterpiece 216 Replay Unit which offers up to eight selectable pre-programmed shows. Access to the lighting control is via a 12-channel Masterpiece Outstation with status indicators, which provides simple, pushbutton remote access to the pre-programmed shows. In the spinning studio, a separate lighting system has been installed based on two Abstract VRX Gladiator units with rotating gobos and a dedicated VRX controller. Bodyworks fitness manger Mark Mitchell, is delighted with the results. "We already had a full Sky TV and surround sound system, but no way for exercisers to make individual choices about what they wanted to watch or listen to," he explained. "The 24-station Audeon system that Sound Division has installed for us gives customers a choice of eight different sources ranging from satellite and terrestrial TV to radio or even DVD if they want, all accessible via their own personal control panel on each machine, into which they simply plug a pair of headphones. Our customers appreciate it enormously, especially now that we've got 42" plasma screens and a couple of 26" LEDs to watch rather than the standard TV sets we had previously!" Mitchell also praised the Tryka LED colour changing system. "The constantly changing colour washes around the room look absolutely wonderful," he enthused. "It really makes for a far more interesting and fun exercise environment than the traditional white walls and florescent lights of yesteryear!" Sound Division's David Graham is also pleased with the outcome. "Although technically speaking, this was a reasonably straightforward project, there was nevertheless quite a lot of technology involved that required a certain amount of expertise," he remarked, "especially when it came to programming all the lighting. Thanks to our team's hard work, the end result looks fantastic and the client is happy, so I think we can consider it a job well done."